A couple of posts previously, we saw some evidence of the life of Captain George Poynter Heath, the port master of Queensland at the time of secession. Today we will hear a bit more about his work, thanks to a chance encounter I had last week. The tricky entrance to the Brisbane River to commence the upstream journey to the port of Brisbane had confounded mariners since Captain Cook's voyage up the east coast of Australia. If Brisbane were to become a port of note, then it was imperative for a safe means of entry to be navigated and charted. This is where Capt Heath comes in. In 1879, he sounded a deep water entry from Caloundra, through Moreton Bay to the east of Bribie Island, then into the river. It became the principal route into Brisbane, and is known as the North West Channel. It is still used by vessels today, even though they are of dimensions that would have been unimaginable to Heath. Once the channel was charted, the next task was to provide lighting to mark safe passage for vessels entering the channel at night. This was completed in 1896, when lighthouses were constructed at Caloundra (to mark the entrance) and on Bribie Island. The lighthouse tower at Caloundra was based on an earlier design by Robert Ferguson of the Colonial architect's office under FDG Stanley, and was constructed with a timber frame covered by corrugated iron sheeting. For those of you interested in the development of lighthouses in Queensland, I commend this paper written by leading Brisbane conservation architect Peter Marquis-Kyle. 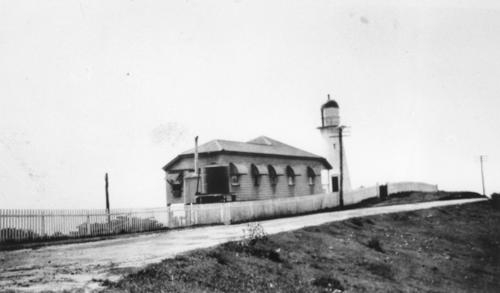 Here is an early photograph of the Caloundra lighthouse, with the lighthouse-keeper's cottage in front. The lighthouse gradually became the symbol of Caloundra, with local schools and sporting clubs including it as a part of their name or logo. And this is what the original lighthouse looks like today. Last week I happened to be travelling past the lighthouse, so I stopped to take some photographs. Then I noticed that someone was inside - that someone was local volunteer Wayne, of the Friends of the Caloundra Lighthouses, who cheerfully showed us around. Lighthouses? 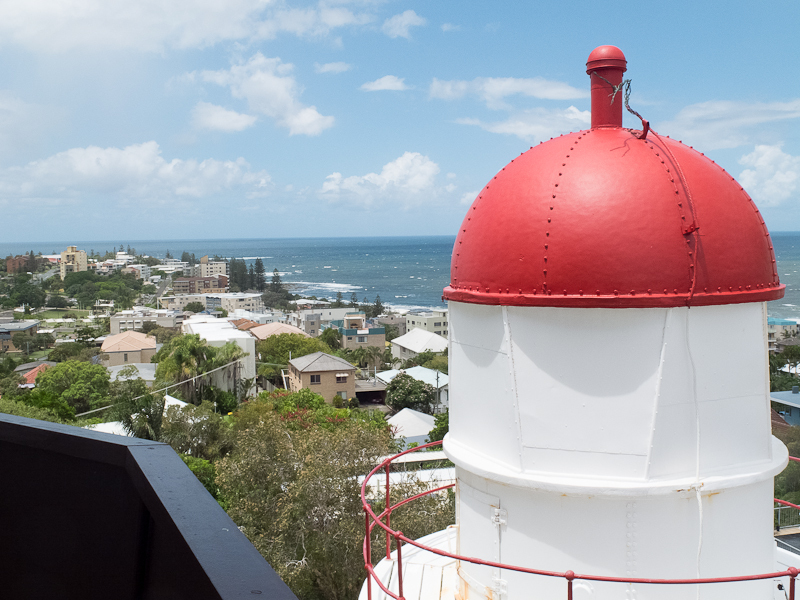 Yes, there are two lighthouses situated next to each other atop the highest point in Caloundra. 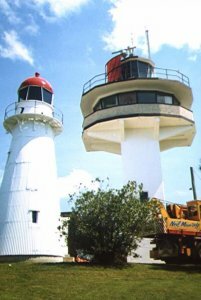 The original lighthouse, having guided thousands of ships into Brisbane, and having given valuable service during WWII as an observation post, was replaced by a concrete structure in 1967. The intention was to demolish the original tower, but it was saved by community pressure and removed to another site in 1970. The second lighthouse operated until 1978 when its duties were passed to a new lighthouse at Point Cartwright. In 1999, the old lighthouse was restored to its original site, and the two towers now operate as a historical tourist attraction. 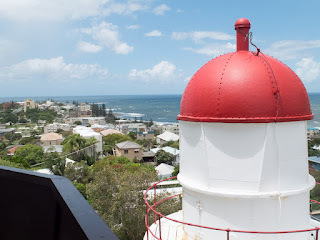 Click here to see a pictorial of the lighthouses from the local newspaper, Sunshine Coast Daily. I agree that if Brisbane was going to be an important port, then it was imperative for a safe means of entry to be navigated and carefully charted. Yet the first lighthouses weren't built until 1896. Was there no shipping before 1896? Or did they travel safely via prayer, not via good science and technology? They would have had charts, as well as the then current navigation aids such as a sextant and a depth-sounder (a weighted rope with knots a known distance apart, I think!). Obviously eye-sight was critical, and the lighthouses were able to solve the problem of not being able to see landmarks at night.